PayTM is running a Offer on Brand factory passes now you can get Upto Rs. 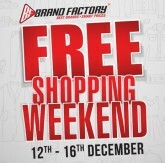 250 Cashback on Brand factory passes by using cashback code BF100.Book your ticket to BRAND FACTORY FREE SHOPPING WEEKEND (12-16 December) and get the money back too.Check more details on Brand factory website.Brand Factory's Free Shopping Weekend is the most awaited shopping event of the year! It promises everyone Effectively FREE SHOPPING on 200+ brands such as Jack & Jones, Levis, Wrangler, Vero Moda, Chemistry, Arrow, Lee cooper, Adidas, Reebok and more. Shop from categories like Menswear, Womenswear, Kidswear, Denims, sportswear, luggage & More! 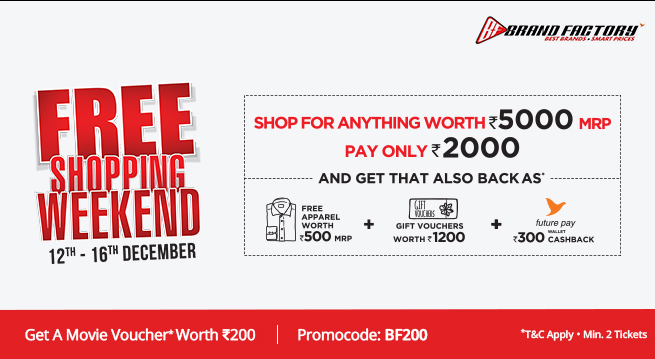 Free Shopping Weekend will make every shoppers' dream of shopping for free, come true. Last year's edition of Free shopping Weekend was the world's first ticketed event for shopping and this year's edition has a lot more in store. Book Redeemable entry Pass NOW! Shop for Any merchandise worth INR 5000 (MRP), and pay only INR 2000 & get this amount back through free apparel worth INR 500, and gift vouchers of INR 1200 & INR 300 cashback through Future Pay Wallet - making your entire shopping experience, effectively, free! Please note: This offer is valid for a minimum purchase of INR 5000 MRP and multiples thereof. The two pass options You need to buy a Redeemable pass - Premium or Classic - in order to come for Free Shopping weekend. There are limited Premium passes (INR 250) that admit two, and allow early entry to the store (8 AM onwards) so that you can be the first to get your hands on all the best merchandise! The Classic Pass (INR 100) guarantees entry to the store after 11 AM. And don't worry, the cost for both types of passes will be refunded to you, in the form of Unconditional Gift Vouchers.